Wilcox’s One Hole Army Compatible Ratchet Strap Shroud mounts onto any standard MICH/ACH style helmet drilled with a single-hole pattern. The shroud features a front bracket to ensure a secure fit of the NVG mount and goggles and is made of aerospace grade aluminum and a molded polymer. 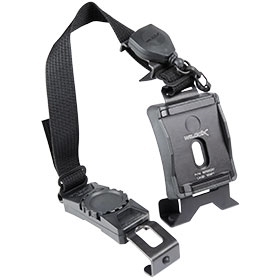 The strap utilizes a ratchet cinch mechanism that will not accidentally come undone or loosen over time.